I matriculated in 1978 and studied further at the University of South Africa, graduating with a Bachelor of Arts degree majoring in Psychology. I love animals and have a passion for horses. I used to compete in show jumping and competed in the showing team representing the Free State. When I was pregnant with my second child I had an accident in the jumping ring and was advised to stop riding. This left me in a quandary. A friend saw me do some drawings and suggested I should try my hand at it. My husband Peter bought me a book on oil painting and since that day in 1997 I am totally addicted to painting. I started out by spending many months and countless hours copying paintings from the Old Masters. When we moved from Welkom (in the Free State) to Cape Town I studied at the Ruth Prowse School of Art and Design and I did life drawing at the Frank Joubert Art Centre. I have always admired artists from America and I joined the Portrait Society of America in 2000. In 2002 I joined them for their annual Portrait Conference and in 2006 I was awarded with a tuition scholarship from the Portrait Society of America and in 2008 I went to America for the third time to join the conference and to learn from the worlds premier portrait artists. In 2010 I invited one of the Portrait Conference teachers, Judith Carducci, to my studio to give a portrait workshop. In 2011 I did a course at ACASA (Academy of Classical Art South Africa) in Classical Drawing based on the methods of the Florence and Angel Academy in Florence Italy. In 2012 Judith retuned and gave a combined landscape and portrait workshop. I paint in oils and enjoy doing drawings in graphite. Once I have completed a painting or a drawing I frame my own work. I only use the best art materials available in the world today. The canvas I use is Belgium Linen and I do have a preference for Rembrandt and Winsor and Newton Artist grade oil paints. I prime my canvas first and once the primer has dried, I put a wash on it before I start the drawing and then the painting. I think about, and plan my paintings carefully. I want my paintings to be a honest representation of my experiences. In most cases those experiences involve another person or animal. What interests and challenges me is to captivate the expression or emotion of one moment in time. Once composition is determined, I draw a head study in graphite, in order to get a feel for the subject. 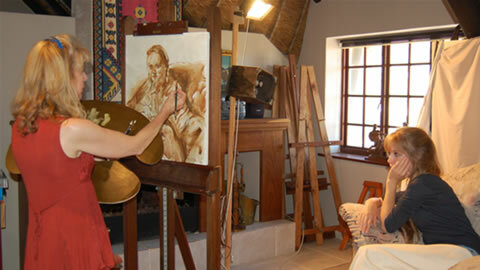 I then move to my canvas and draw my subject with paint (earth colour). Colour relationships, colour temperature and values are established from life. I ask the sitter to come to the studio for a live sitting. I then continue to paint the portrait, referring to the many digital photographs that I have taken and loaded onto my computer. Periodically I require the client to come for a sitting. It is important to have "live" sessions because photography has many limitations. I work in oils and light dictates the way I set up my paintings. Sometimes I work wet-in-wet without allowing the paint to dry between layers of application, and other times I apply wet oil colour over layers of dry oil colour. I am fascinated by colour and have studied colour intensively. I enjoy texture in my paintings and often use the palette knife. What I strive for and hope to achieve everytime I paint is to see my subject as an abstraction and to place the little shapes of colour in the right place on my canvas with correct value and edges. “Painting has given me a better understanding of myself, of life and of human existence and I will always be a student of painting and I hope to always express myself in a truthful and honest way”.